HAYWARD, California, April 11, 2019 /PRNewswire/ — RayVio Corp., an advanced health and hygiene company, is shipping its new, 308 nm XR UVB LEDs and supporting the development of phototherapy treatments for skin diseases. RayVio’s new XR UV LEDs enable targeted therapies, smaller and lower cost treatment devices, and superb reliability. 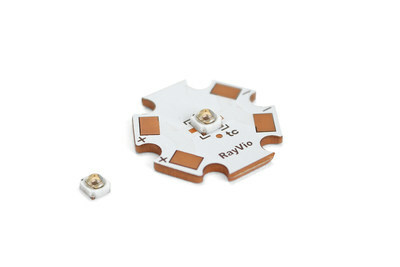 Available directly from Digi-Key as an emitter or pre-mounted on a star board for easy development and product integration, RayVio’s new LEDs deliver 13 mW at 100 mA and are rated for up to 10,000 hours of continuous use. RayVio’s XR 308 nm UVB LEDs are key to improved treatment options for Psoriasis and Vitiligo. RayVio has achieved record-setting performance of 300 mW output at 308 nm from a single UV LED package and is already sampling this option to customers. Its advances in LED technology for phototherapy and Vitamin D production are also advancing and the company is preparing a more powerful, 293 nm emitter in 2019. RayVio’s work in the UVB range for phototherapy applications complements its pioneering UVC LED technology that offers leading performance for disinfection and sterilization applications like water purification.